His Latest Favourite iPhone Game - Golf! This is our boy’s latest favourite iPhone game. 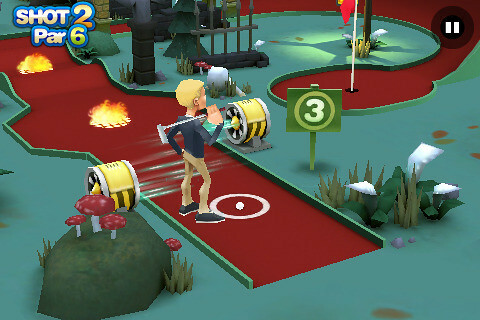 It’s called the 3D Mini Golf Challenge, a lovely miniature golf game created by Digital Chocolate. It’s available in two versions – free version (lite) and full version at a little cost of US$1.99. Expansion packs are also available for the full version. 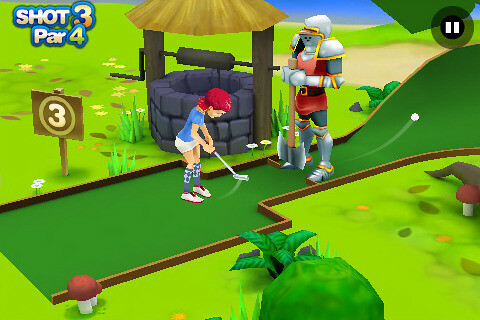 At the beginning of the game, the player has to select either a male or female golfer. And so, Little Edison selected the female golfer. Then, he will begin with the first 100 holes of miniature golf fun. He has to compete for points at each hole to unlock more. In short, the game requires him to visualize the course and figure out on how to manage the obstacles like fire pit, fan, skull etc in each stage. Some of them are quite difficult, even for adults. He will line up his shot with a swipe of a finger. A handy shadow will appear showing the direction and strength. Once he is comfortable with setting, he will release his finger from the screen to shoot the ball. I remind him to watch out on the strength, depending on the distance of the hole. Now, he’s an expert! When he’s stuck at certain stage, he will consult us for help. It’s also a good bonding time for us when we indulge in a game at night – usually within fifteen minutes or so before bedtime. Whenever his ball rolls into the fire pit, he yells, “Aiya, my ball is burnt!” When he managed to complete a stage and unlock the next, he’ll run excitedly to me explaining how he did it. This is our boy playing with the golf game last week at my parent’s home. And he got Jaerone (his cousin) excited about it too. The two boys love the game so much! As to fear on whether he’ll get addicted, we will limit the game to half an hour each time. He still enjoys playing with other educational games that I bought for him, and he still wants me to read his Dora and Diego Phonics Books with him. So, I guess it’s still alright now. For me, it’s rather difficult to limit cos my HB himself is a big fan of computer games as well as iPhone games. Haha! As for Edison, I’ll allow him to play as long as he play moderately and does not affect his study or behaviour. Sometimes, iPhone is really indispensible expecially when we’re dining out. It keeps him seated throughout.